LTA’s latest statement raises more questions than it answers. We learned that the two “protective bubbles” around the train both went down long before it was hit. These protective bubbles are critical safety features that alert nearby trains to stop, so as to avoid collisions. Here are 8 questions I would like to ask. LTA’s latest statement, Investigation Findings on Train Collision at Joo Koon MRT Station, raises more questions than it answers (but good work by the civil servants and SMRT/Thales engineers who put it together). We learned that the two “protective bubbles” around the train both went down long before it was hit. These protective bubbles are critical safety features that alert nearby trains to stop, so as to avoid collisions. LTA’s graphic (part 2) indicates that the first protective bubble went down as soon as the train left Ulu Pandan depot (located between Jurong East and Clementi) due to an “abnormal condition.” Then it was “unexpectedly disabled” when it passed by a “trackside device” at Clementi (while heading east towards Pasir Ris). 1. What caused the protective bubbles go down? What are these trackside devices? Why are they permitted to disable a critical safety feature on a train? And what was the “abnormal condition” that caused the first bubble to go down? 2. Once the second bubble went down, by design an 18 km/h speed restriction was imposed by the new signalling system, which was operating in passive mode. But LTA said the train continued to travel under the old signalling system. So was the 18 km/h speed restriction ignored? 3. Why wasn’t the train automatically brought to a stop or slowed down when the protective bubbles went down? Was an alarm triggered to the Ops Centre? 4. Why did the train continue travelling for almost 2 hours (49 stations) from Clementi to Pasir Ris and back to Pioneer before the driver noticed something was amiss? 5. The NEL and DTL are driverless, unlike the EWL. What happens if the protective bubble goes down on those trains? 6. How many times has this protective bubble gone down without anyone noticing and the trains continued operating? The statement said that the new signalling system runs in the background in passive mode between Pioneer and Pasir Ris to “collect data for the purpose of performance monitoring.” So there should be logs to trace back the answer. If the answer is “it has gone down many times”, then this accident was not “bad luck”, but it was “good luck” that there weren’t more accidents earlier on. 7. Once the train arrived at Joo Koon and was de-training all its passengers, why was the next train allowed to come within 36 m, if the stationary train’s protective bubble was gone? A train approaching the platform at 50 km/h will take less than 2.6 sec to cover 36 m. Is it SOP for trains to get so close before stopping? 8. Lastly, did anyone tell the driver of the train behind that the train ahead had no protective bubble? Evidently not, because he didn’t think anything was amiss and therefore did not react in time when he realised the train was lurching forward. At WP Youth Wing’s Youth Hangouts yesterday, we discussed the topic of democracy. We had a very encouraging turnout from mostly polytechnic and university students. Diverse views were shared but we all agreed that the objective of democracy, or any political system, must be to improve the welfare and happiness of citizens, not to pursue some esoteric ideological objective. I observed that increased political competition, with more opposition MPs in Parliament, gives citizens greater “bargaining power” over the government. This was clearly evident after 2011 when the number of WP MPs increased more than four-fold: the PAP government introduced an unprecedented raft of social welfare policies to win back the support of the people. We discussed recent statements coming from government affiliates that Singapore may be more efficient as a one-party dominant state, that internal contestation within the ruling party suffices and that Singapore’s “unique” circumstances necessitate practices that deviate from democratic norms. I shared my views about the oft-raised spectre of “gridlock” should there be too much political competition. Gridlock, whereby legislation cannot get passed, can only happen if (1) neither party has a majority in parliament and (2) the parties are working solely in pursuit of partisan interests rather than the good of the country. Singapore’s parliament currently has a super majority of government MPs: 83 PAP vs 9 WP, with 9 NMPs (who are technically “politically-neutral” but almost always vote with the PAP). Most laws require only a simple majority (i.e., currently 51 MPs) to pass. Even if WP were to win one or two more GRCs in the next elections, we would have only 14 MPs — hardly enough to even block constitutional amendments (which require a two-thirds majority). On the second point, one participant asked me: If one day the opposition were to make significant gains in numbers, would we cause gridlock? I could not say with absolute certainly that there won’t be gridlock but WP’s track record as a parliamentary opposition is that we have supported all legislation that improves the welfare of the people, and only opposed bills that were, in our opinion, designed to give the incumbent regime a partisan advantage. In any case, not all obstruction of legislation is necessarily bad. If there is a sinister piece of legislation that hurts Singaporeans, wouldn’t you want your MP to oppose it? Nevertheless, I emphasised that it is important that voters choose only high-quality MPs at elections, and do not simply cast protest votes. I also shared about the importance of having strong and independent institutions, a diverse and independent media and a valid system of checks and balances on the government. In good times, it’s easy to overlook their importance. However, should the governing elites turn rogue, can we confidently say that our current institutions will be able to stand up to power and say “no”, like they do in more developed democracies? Another question from a participant that stood out to me was: If things are going well now, why should I care about the composition of parliament and the state of our democracy? My answer was that political institutions and political parties cannot be built overnight. We will rue the day if the current governing party were to lose the confidence of the people and a group of political greenhorns or a populist demagogue were to top the polls and take over the reins of government. Much better to start building up the capacity and capability of a credible opposition party now, than to scramble when it’s too late. Author Gerald GiamPosted on 20 February 2017 20 February 2017 Categories SingaporeTags democracy, WP Youth WingLeave a comment on Whither democracy? Now the Prime Minister exhorts us to lower our expectations for future economic growth. Frankly I’m not confident that we can even achieve 2-3% growth with this government’s economic policies. Productivity, which is the main driver of quality growth, has been flat or negative for the last 4 years. The main thing that’s propping up growth these days is labour inputs, largely from the (still) growing foreign labour force. The PAP has staked its electoral legitimacy all these years on “delivering the economic goods” (i.e., growing the economy and providing good jobs for all). Now we clearly have a segment of PMETs who find themselves made redundant or at risk of being made redundant in their jobs. Quite a few have been sacked or forced to resign in what are, in fact, retrenchment exercises. Many have no choice but to take on jobs that are below their qualifications (which they worked so hard for). Now the Prime Minister expects us to lower our expectations for future economic growth. Frankly I’m not confident that we can even achieve 2-3% growth with this government’s economic policies. Productivity, which is the main driver of quality growth, has been flat or negative for the last 4 years. The main thing that’s propping up growth these days is labour inputs, largely from the (still) growing foreign labour force. The fact that last year’s anaemic economic growth of 1.8% — which is lower than all our neighbours and the other erstwhile “Asian economic tigers” (South Korea, Taiwan and Hong Kong) — coincides with the smaller inflow of foreign workers, is an indication that our economy has been overly dependant on foreign labour force growth. Successive PAP governments did not invest enough in our citizens by equipping them with the necessary skills, especially technology skills, to thrive in this technological age. Instead they took the shortcut to growth by importing cheap labour. Now the chickens have come home to roost, and hardworking Singaporeans are paying the price. Do Singaporeans realise that their “investments” in the PAP (through their votes at the polls) are producing diminishing returns? Today, online gambling is legalised. Tomorrow, a third casino? We cannot continue handing them a blank cheque to do as they please. Twelve years ago, the national debate on whether Singapore should allow in Las Vegas-style casinos ignited my interest in discussing policy issues that affect country’s future. I followed the debate closely, spoke with friends and family about it, and attended several government feedback forums to voice my views. I wrote letters to a junior minister, went to lobby my local MP at his meet-the-people session, and even started a petition (the hard copy sort), collecting dozens of signatures from my church friends before submitting it to the government. I was a wide-eyed, idealistic kid, who thought that the government was sincere about seeking feedback from ordinary citizens, and that this feedback would be able to influence the final decision. Alas, that was not to be. The following year, Prime Minister Lee Hsien Loong dropped a bombshell: The government had decided to go ahead with the casinos – and not just one casino, but two. Scales fell off my eyes that year. Until then, I thought that the PAP government was by and large a “righteous government” that governed in the best interests of the people, making politically unpopular decisions because they were morally right. But I could not see anything right in the casino decision. I lost my esteem for the PAP that year, no longer seeing them as the flagbearer of a “righteous government”. Far from it. I concluded that positive change from within would be impossible in Singapore. Less than two years later, I joined the Workers’ Party (WP), which to its credit, fiercely objected to the introduction of casinos. Events over the past week have brought back memories of my political awakening. Last Thursday (22 Sept 2016), it was reported that the two state-owned gambling operators, Singapore Pools and Singapore Turf Club, had submitted applications to get exemptions from the ban on online gambling. This came as a surprise to many Singaporeans, but my WP colleagues and I saw it coming. Back in 2014, when the Remote Gambling Bill was tabled in Parliament, we spotted a seemingly innocuous provision for a “not-for-profit entity that distributes the moneys forming part of its funds to public, social or charitable purposes in Singapore” to be granted an exemption from the ban, if the Minister for Home Affairs so decides. Who else would fit that description? It was a piece of legislation that would deal these two gambling operators a monopoly in online gambling. My then-parliamentary colleagues Pritam Singh, Png Eng Huat and Yee Jenn Jong argued strongly against it, and even called for the bill to be referred to a Select Committee for further scrutiny and to gather more expert views, with a view of removing that odious provision. This was rejected by the government, which went ahead to pass that bill the same day with its super-majority in Parliament. On Tuesday (27 Sept), knowing that it was our last chance to stop the exemption from being granted, WP issued a statement, calling on the government to reject both applications. Separately, another group had launched an online petition on 15 Sept, urging the same. This petition has gathered 12,447 signatures (including mine) as of the time of writing. There was no response from the government until Thursday afternoon when they announced that both operators had been issued a certificate of exemption, paving the way for them to begin operations as early as next month. That the operators can now simply flip the switch and launch their gambling websites so soon after getting their certificates could only mean that they knew long ago that they were going to get the nod. Indeed, 15 months ago, one of them had reportedly engaged a giant British online gambling software developer in a contract worth $10 million to build their new gambling website. It turns out this was a fait accompli from day one! Everyone I have spoken to is against opening up our country to online gambling – family, friends, residents whom I just visited yesterday evening during house visits. One resident told me in exasperation, “这样会害死人! (figuratively, “this will bring much harm to people”) and pointed out the contradiction that the government had been broadcasting advertisements on TV discouraging gambling, yet had gone ahead to expand access to gambling. Whom exactly will this decision benefit? Certainly not those who are going to get hooked on gambling, with online betting becoming a “gateway” to more high stakes gambling. Twelve years after that fateful casino debate, Singaporeans are staring at yet another decision that brings the vice of gambling closer to home (in fact into homes), albeit this time without the “hassle” of a six-month public consultation exercise like they had for the casino debate. King Solomon once said that “righteousness exalts a nation”. It has become clear to me that the PAP has long lost its aura of “righteousness”. Today, online gambling is legalised. Tomorrow, a third casino? We cannot continue handing them a blank cheque to do as they please. I recall one instance when one of them was transiting through Singapore and requested a call on the President that very morning. We hurriedly put up the request, expecting the President to decline. To my surprise, he agreed, even though he was not at the Istana that morning — he had to rush down for the meeting. As far as I remember, never once did he decline a call. Such was the nature of the man. He took his responsibilities very seriously, and carried our flag with much grace and dignity. One of my earlier interactions with President S R Nathan was when I was a junior officer in the Ministry of Foreign Affairs. I was staffing a desk which covered 53 countries, which meant there were many presidents and prime ministers visiting Singapore every month. Very often, they would request a meeting with the President at very short notice. I recall one instance when one of them was transiting through Singapore and requested a call on the President that very morning. We hurriedly put up the request, expecting the President to decline. To my surprise, he agreed, even though he was not at the Istana that morning — he had to rush down for the meeting. As far as I remember, never once did he decline a call. Such was the nature of the man. He took his responsibilities very seriously, and carried our flag with much grace and dignity. My wife and I would like to join my WP colleagues in extending our deepest condolences to the family of the late President Sellapan Ramanathan. I feel very sad reading the news report on the Coroner’s inquiry and his conclusions, including the finding that less than 2 hours after leaving the police station, 14-year old Benjamin Lim committed suicide. While the Coroner said that had not come across anything that was not in accordance with police or school procedures, he recommended that school counsellors accompany students to the police station before and after police interviews. I hope the police and MOE will not just “consider” the Coroner’s suggestion, but will implement this basic step without delay. The Coroner said that the school counsellor should have spoken directly to Benjamin to convey the message from the school that it would be better for him not to attend the school camp. He revealed that multi-agency research is being done to study youth suicides. This is an important area of research, and I hope that the study will be made public in due course. It will be useful for not just the police and schools, but also parents like myself who want the best for our children, but are not always equipped to handle every challenging situation with them. One young life has been prematurely ended. We as a society must do all we can to prevent a similar tragedy from recurring. While I will no longer be an NCMP, I intend to continue serving residents on the ground in East Coast GRC and through my Party in the areas of policy research and media. I would like to thank all the residents of East Coast GRC who have supported me and WP in the past two elections which I contested, and I look forward to greater interactions with you over the next five years. For those who did not vote for us, I especially look forward to an opportunity to understand your concerns, hopes and dreams, and to be able to serve you better in the future. Last night, the Workers’ Party’s CEC (Central Executive Council) met to decide on which candidates would accept the Non-constituency Member of Parliament (NCMP) positions, following the results of General Election 2015. The press release on our decisions is here. Before a vote was taken on the nominee from the East Coast GRC team, I asked the CEC to consider nominating Leon Perera and, if Parliament decides to open up the vacated seat left by Lee Li Lian, for Daniel Goh to fill it. I am happy that the CEC unanimously agreed to this proposal. The East Coast team had earlier discussed this matter amongst ourselves and we agreed that Leon and Daniel would be the most suitable candidates as NCMPs. They have both taken leading roles in policy work within our Party, and I am confident they will be able to make very positive contributions to Parliamentary debates and speak up for not just residents of East Coast GRC, but all Singaporeans. I am grateful to have had the privilege and opportunity to serve as an NCMP in the 12th Parliament of Singapore. It was a very fulfilling four years. I learned so much from the debates, the policy research that we did, and from my fellow MPs, volunteers, residents and the subject matter experts I consulted. I am very thankful to all those who helped me fulfil my NCMP role, including the WP volunteers who gave up so much time to help me in policy work and ground outreach. Special thanks go to my wife and parents who stood by me through all the trying times, as well as my two young kids who were always understanding when I told them I couldn’t spend time with them because I was going out to a certain “Party”. We need to build up institutions to guard against future government failure. We all know we need to buy insurance before something bad happens, not after. It’s the same for government. We need to slowly build up a credible alternative party so that if the ruling party fails, the alternative can step in to take its place, and Singapore will continue to progress and thrive. This process could take years and many election cycles. The Workers’ Party has started this process of building with your help. In this election, we need to work together to continue to build a credible alternative. My fellow Singaporeans, and voters of East Coast GRC and Fengshan SMC. A very good evening to one and all. To my Tamil-speaking friends, Vannakam! Para pengundi GRC East Coast dan SMC Fengshan, salam sejahtera! Keputusan pilihan raya kali ini dijangka sangat sengit. Tolonglah kami untuk mengongsi mesej kami kepada keluarga, teman-teman dan jiran-jiran anda. Sila berkongsi dengan mereka mengapa anda mengundi Parti Pekerja. Kongsilah dengan mereka mengapa anda melakukan perkara ini bukan hanya untuk diri anda, tetapi untuk anak-anak anda. Undilah Parti Pekerja! Memperkasakan masa depan anda! I think this sums up very well what the PAP thinks about democracy and debate. They are not interested in debate. They want all of us – including the opposition – to agree with them. Even in Parliament, they get so ‘kancheong’ when just the few of us oppose a Bill that we think is bad for Singapore, even though they have a Parliamentary super-majority to ram anything through. Imagine how much more responsive they will be to you, if we have 12, 18 or 20 Workers’ Party MPs in Parliament? Don’t worry about “weakening” the PAP. They don’t need so many backbenchers. Some of their backbenchers hardly participate in Parliament. In the last Parliament, there were some PAP backbenchers who didn’t even make one “impactful” speech. We don’t need more cheerleaders in Parliament. We need more representatives who can think out of the PAP box and are bold enough to confront the government with the people’s concerns. The problem we have in Singapore is not that we have too much debate, but too little debate on government policies that affect your lives. Look at the population policy in the decade before GE 2011. The PAP didn’t table any population white paper for debate in Parliament. They just went ahead and let in one million people within the span of ten years. It took a shock loss of Aljunied for them to realise that our infrastructure was bursting at the seams and that Singaporeans felt they were losing their identity. My fellow Singaporeans, over the past two weeks, my colleagues and I from the Workers’ Party have put forward many practical policy proposals for improving the lives of Singaporeans. Most of these are from our Manifesto, which forms the blueprint of what we are going to push for in Parliament if we are elected. I trust that you can see that we are a party that has many serious, well-thought through proposals to bring to Parliament. If more of us are elected, we are confident that Parliament will become a more lively and effective forum for airing Singaporeans’ concerns and arriving at better solutions for our nation’s future. As this is my final speech of this election campaign, I want to talk to you about more than just policy proposals. I want to talk to you about what this election is really about. This election is about the future political direction we will take as a nation. The choice is in your hands. We could vote for a Parliament that continues to have a small and under-resourced opposition, or we could vote for a Parliament that has a strong alternative party that is able to give you more bargaining power with the government. We know the PAP is going to be returned to power on Polling Day. But do you know if there are going to be enough Workers’ Party MPs to be a strong alternative voice for you in Parliament? Some of you may have received messages from the PAP and its supporters, telling you there is no need to “check” the PAP, because they are doing such a great job. Even if the PAP has done a good job over the past 50 years, can you be sure that future generations of PAP leaders can match the ability and drive of Mr Lee Kuan Yew and his pioneer cabinet colleagues? 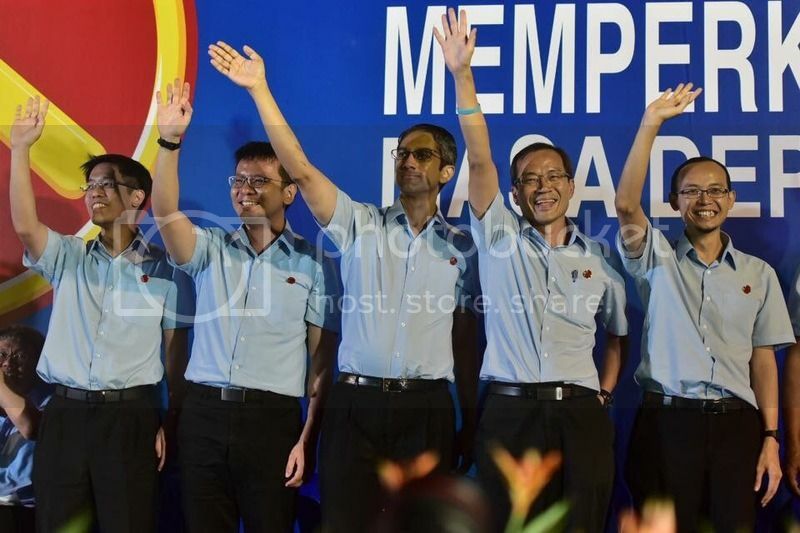 Looking at the current batch of PAP candidates, do you see any Lee Kuan Yews, Goh Keng Swees and S. Rajaratnams? So the question is: Are you willing to place the future of your children entirely in the hands of the PAP of 2015? Two is not enough. Seven is not enough. We need many more MPs in Parliament to change the political balance in Singapore. Voters of East Coast GRC and Fengshan SMC, this is one of the most important elections in Singapore’s short history. It is the first election since Independence where all the constituencies are being contested. It is the first election since the watershed election of GE 2011 where we saw a breakthrough in Aljunied GRC. East Coast and Fengshan are at the front lines of this battle. We are at the tipping point of political progress in Singapore. Your vote will determine whether the opposition can make inroads beyond Hougang, Aljunied and Punggol East. The election results are expected to be very close. We ask for your help spread the word to your family, friends and neighbours. Please share with them why you are voting for Workers’ Party. Share with them why it is important to ensure there are enough credible and responsible opposition MPs in Parliament to check the power of the PAP. Share with them why this election is our best chance to end the one-party state dominance of PAP. Share with them why you are doing this not just for yourself, but for your children and their future. Come September 11th, vote for the Workers’ Party. Empower your future! Empower Your Future. Vote Workers’ Party! We will only campaign to form the government when we feel confident of governing the entire country and ensuring Singapore’s continued prosperity and success. This is the responsible thing to do. So until you hear us say, “Vote for us to form the next government”, don’t believe our opponents who say that we have hidden agendas, motives or plans. We don’t. What you see is what you get. Fellow Singaporeans and voters of Marine Parade GRC and MacPherson SMC, good evening! I replied that this goal is still relevant, but that for this election, we are not campaigning to form the government. Instead, for this election we want to empower your future by entrenching a credible opposition presence in Parliament. Some people may be concerned about scare tactics used by the PAP. They say that we are seeking to form the government in a “not too distant a future” and that if we win many constituencies combined with other opposition parties then Singapore is “sunk”. Let me clarify some misconceptions about how a government is formed. First, in a Westminster parliamentary system, which is what Singapore follows, a government can be formed only by the party or coalition that wins the most seats in Parliament, but not necessarily an absolute majority. This means that even if the PAP does not win more than half the seats in Parliament, they can still form the government. This is similar to what happened in the 2011 Presidential election. Dr Tony Tan won only 35.2% of the popular vote but he still became president, because the next best performing candidate, Dr Tan Cheng Bock, won 34.9% of the vote. Second, the Workers’ Party is fielding only 28 candidates for this election versus the PAP’s 89 candidates. Even if we were to win all the constituencies we are contesting, we would still have only 31% of the seats. This is hardly enough to form the government unless the PAP wins fewer than 28 seats, which is virtually impossible. Third, we have currently no plans to go into coalition with other opposition parties. We couldn’t even avoid three-cornered fights in all constituencies. Fourth, we will only campaign to form the government when we feel confident of governing the entire country and ensuring Singapore’s continued prosperity and success. This is the responsible thing to do. So until you hear us say, “Vote for us to form the next government”, don’t believe our opponents who say that we have hidden agendas, motives or plans. We don’t. What you see is what you get. Fifth, and I think this is the most important point: We do not see Singaporean voters the same way that the PAP does. To them, voters are gullible and will vote for any party that makes wild promises of giveaways that will drain the reserves. I have a lot more faith in our voters. I’m not saying this just to please you. I’m saying this after seeing the election results of past elections and by-elections, as well as talking to many residents during house visits, both the educated and less educated, young and old. They all want to have a good government and they all know what makes a good government. There is no such thing as a “freak” election result, because any election result in a free and fair election would reflect the will of the people. So I urge you to vote all our candidates into Parliament on September the 11th. You can be sure the Sun will still rise on September the 12th, and not just because the rooster crows. Allow me to move on to share with you more policy proposals that the Workers’ Party hopes to push for in Parliament if we are elected as your representatives. Today I want to talk about healthcare, an issue that is close to our hearts. Healthcare was one of the most frequent issues I brought up in Parliament over the past four years. I proposed many ways to enhance the healthcare system and reduce the financial burden on patients and their families. I asked the government to subsidise MediShield premiums of vulnerable families, reduce out-of-pocket payments for treatment, and eliminate the hassle of means testing. I also called for more systems to be put in place to encourage healthcare providers, including GPs, hospitals and long-term care providers, to cooperate and share patient information with each other, in order to make more accurate diagnoses and provide better care. I said that healthcare providers should be paid based on outcomes, not simply the volume of patients they see. This could lead to healthier patients and lower costs for both patients and the healthcare system. There is still a lot of work to do to improve our healthcare system. One of the areas we want to look more into in the next session of Parliament is primary care. After talking to GPs in the public and private sector, as well as patients, we learned that some of the largest outpatient expenses are for the management of chronic diseases like diabetes, hypertension and stroke. Also, health screening is very important in detecting chronic diseases early, so they can be treated early before complications arise. However, the take up rate of health screening programmes is still quite low now. We want to push for more government subsidies and use of Medisave for the treatment of chronic diseases and health screening. This will not only reduce the financial burden on patients, but it will also encourage them to seek timely treatment before their conditions get worse. Because when that happens, patients will not only have to go through much more pain and discomfort, but it will cost them and the healthcare system more. At the same time, we want to make health literacy a public health goal. Many patients here are still not as health literate as in many other developed countries. We tend to leave it to doctors to tell us what to do. We want to equip and empower Singaporeans to take greater ownership of their health. We can do this through more engaging programmes to reach out to citizens, and through more frequent health screenings and consultations with the same family doctor. We have many more proposals to enhance the healthcare system, which we want to be able to push for. But we need your help, to first send enough of us to Parliament, so that we can advance your interests in healthcare and many other areas. Residents of Marine Parade, one team that I believe can make a great contribution to Parliament is our team in Marine Parade. I have worked closely with Yee Jenn Jong over the last four years as we were NCMPs in Parliament. He was a very dedicated MP who raised up many issues on education, childcare and SMEs. I know he will continue to press the government on important issues if given the opportunity to be your MP. I worked with He Tingru on many healthcare policies over the last few years. She has a great mind to analyse policies and a big heart for people. Firuz Khan worked the ground with me on countless house visits and he knows your concerns well. Terence Tan is a great guy to be around and he brings deep legal expertise to the table. And last but not least, I am confident that Dylan Ng’s banking and financial experience will be a great asset to the team. Please vote for our team in Marine Parade. Vote for the Workers’ Party! Empower your Future! Thank you.